Waste management services are provided by the Waste Services branch. Information on collection of garbage and recycling from Edmonton households. Find out about these convenient waste drop-off facilities for electronics and household hazardous waste. Learn about this unique collection of advanced waste processing and research facilities. A program that teaches volunteers about Edmonton's waste system to teach friends and neighbours how to reduce waste. Book a classroom presenation or facility tour for a school or group. Details on household recycling collection and Community Recycling Depot locations and acceptable materials. Find out how to donate or pick up reusable items at the Reuse Centre and Eco Staton Reuse Areas. 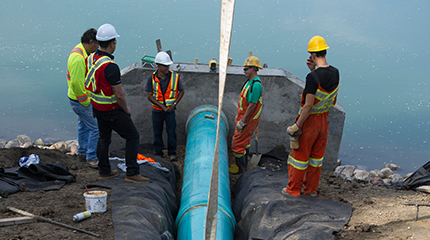 Sewer and stormwater systems are now being managed by EPCOR. General information about flooding, stormwater facilities, drainage rates, manhole cover and catch basin concerns and surface drainage problems is available via EPCOR's Drainage page. Homeowners requesting or petitioning the City for specific improvements are advised to visit the Local Improvement Financing and Financing New Sanitary Trunk Construction pages before proceeding with an improvement request (Note: emergency services do not fall under this category). Guided by the Sanitary Servicing Strategy, a 75 year plan to provide sanitary servicing for new land developments within the City. Details procedures, guidelines, controls and current fees for developers and homeowners seeking drainage services from the City. Summarizes the Design Criteria for Sanitary Drainage and Storm Drainage sewers, as well as the public information available for As-Built Sewers. How was the City of Edmonton’s sewage system built? How is it maintained? What will future development entail? The Sewer System section has all this information and more.